American made products, especially "100% Made in America" may be something of the past. American cars are manufactured with materials and sub assemblies produced in a myriad of different countries. Fast food restaurants purchase their finished frozen meat patties from many global food-processing plants. Clothing companies have been able to survive by hiring migrant workers and/or pay less than living wages. And, of course, if it wasn't for our "guest workers," it would be highly unlikely that we would be able to purchase California grown strawberries for under $5 a box or we would be using South American or African strawberries on our cold cereals and in our smoothies. So, is there anything truly made in America? 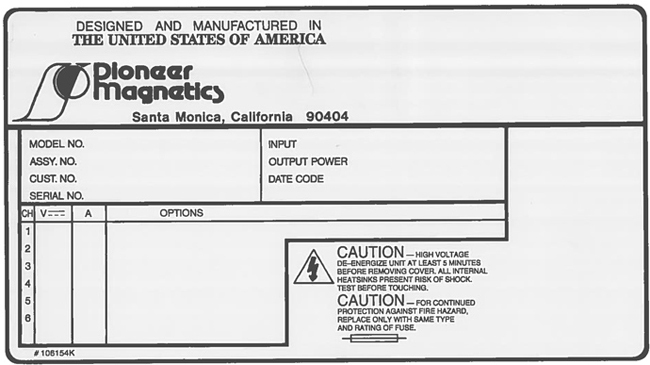 Pioneer Magnetics is a "Made in America" company. PMI is a high-end switching power supply company. The company's focus is high wattage converters with concentration primarily in areas calling for highly reliable, non-stop, low voltage/high current applications. Based in Santa Monica, this Los Angeles area electronic manufacturing firm prides itself in continuing to build close to 100% of its products in The United States of America. Building products in the USA has more of a downside than up. Offshore competition is fierce. Indirectly, some PMI customers have demanded that PMI have its own manufacturing facility based in China, India or some other low-cost-labor country. Some customers have threatened to go to suppliers that have their own offshore capability. PMI's Board of Directors has maintained its philosophical stand that, without a strong manufacturing base, the USA will soon have no base on which to stand, unemployment will, once again, escalate and America's economic stability will, once more, decline. The owners of PMI stand proud with their "Made in America" products.